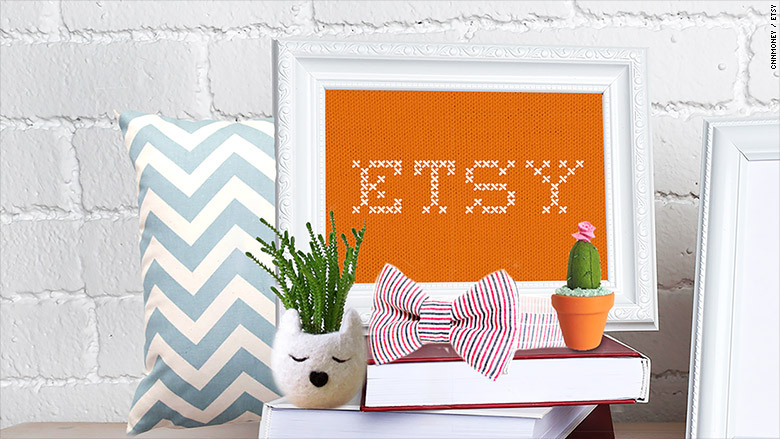 Etsy is taking a stance on gender identity with its latest diversity report. The online crafts marketplace said that it is looking at the gender of its workforce in a non-binary way. That means its 800+ employees had more than 60 gender identity options to choose from. "We think there are ways we can better showcase how a full range of identities often intersect and affect each other," wrote Juliet Gorman, Etsy's Director of Culture and Engagement. "We hope to explore different methods for measuring and reporting that will contribute meaningfully to the larger public dialogue around tech and diversity." It released its latest diversity report on Thursday with the findings: .5% of Etsy's workforce identified as "other awesome gender identity," while 53.9% identified as women and 45.6% as men. It's become the norm for tech companies to release these reports. Most follow a pretty standard format -- breaking down the number of men and women, and their ethnicities, segmented by levels of leadership and technical versus nontechnical roles. But some have opted to slice and dice their data in new and significant ways. Atlassian (TEAM), an enterprise software company that went public last year, broke down the statistics at the team level -- and included age as well. took a different approach, as well. Agism -- as well as disabilities -- can also contribute to inequality in the workplace. Etsy (ETSY) has taken strides to improve its gender diversity -- but hasn't made as much progress with racial and ethnic diversity. Half of its managers are female -- up from 44% in 2015. (9 out of 10 Etsy sellers are women.) On the other hand, just 3.2% of its workforce is black and 3.9% Latino -- while 78.6% are white. The company said it's working with organizations like Jopwell and DigitalUndivided to recruit more diverse candidate. Etsy -- and its CEO Chad Dickerson -- hasn't been shy about standing up for inclusion. Last year, Etsy posted signs on the bathroom doors of its Brooklyn headquarters. "While the law requires gender binary signs on the doors, we believe that gender is not binary. Please use the restroom that feels more comfortable for you," read the sign, which Etsy engineer Sara Bee tweeted a photo of in December. And just last Friday, Dickerson -- who grew up in North Carolina -- spoke out about HB2, the so-called "North Carolina bathroom law." HB2, which passed in March, prevents cities from creating non-discrimination policies based on gender identity. It also mandates that students in state schools use the bathroom that matches the gender on their birth certificate. "It doesn't reflect the North Carolina I know, a state historically recognized for its progressive voice," Dickerson wrote on Medium. Dickerson wrote that at Etsy -- which he took public last year -- he's working to build an accepting environment. "In our offices around the world, we encourage all employees, regardless of their gender, to use the restrooms that feel most comfortable to them, and this transition did not lead to disruptions or conflicts. Our experience is a working, pragmatic antidote to the alarmist rhetoric being thrown around by the proponents of HB2."